1) BLG 1836 Vol I – Rev William Bickford Coham. The Arms, as illustrated, appears to be those of Holland – Semee of fleur-de-lys a lion rampant. The Arms, as in the text, Azure a lion rampant between three fleur-de-lys. 3) Heraldic Illustrations 1846 – William Holland Bickford Coham – Quarterly 1st Per chevron engrailed Gules and ermine in chief five fleur-de-lis three and two and in base a lion rampant Or (for Coham) 2nd Azure semee of fleur-de-lys a lion rampant guardant argent langued and armed Gules (for Holland) 3rd Argent a chevron engrailed Sable between three martlets of the second (for Bickford of Dunsland) 4th Per chevron Azure and Ermine two stags’heads cabossed Or (for Arscott of Arscott). 4) Armorial Families 1902 – John Blyth Coham-Fleming – husband of Eleanor Mary Bickford Coham, daughter & heir of W H B Coham. Assumed by Royal Licence the Name & Arms of Coham to be borne quarterly with Fleming. Quarterly 1st & 4th quarterly I & IV Gules on a chevron Argent three fraises Azure (for Fleming) II & III Per chevron engrailed Gules and ermine in chief five fleur-de-lis three and two and in base a lion rampant Or (for Coham) 2nd Gules on a chevron Argent three fraises Azure (for Fleming) 3rd Argent on a fesse indented between three crescents Gules as many garbs Or (for Blyth). The narrative from various BLGs and Heraldic Illustrations show that the Cohams married heraldic heiresses for Holland and Bickford & Arscott. Looking at the Arms granted to Coham it would appear that they are a composition of various components from the Arms of the heiresses. Unlike in Scotland, in England (as I understand) the Arms of an heiress that are not passed on to her children cannot be “resurrected” by a descendant later becoming armigerous. 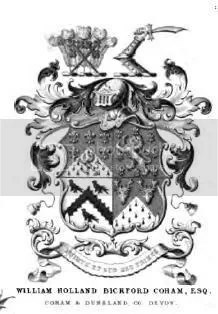 I presume, therefore, that W H B Coham could not petition for Arms in memory of either his grandfather or his great great grandfather so as to “pick up” the Bickford & Arscott and the Holland quarters respectively – even if both gentlemen could have qualified for Arms in their own right. The illustration in Heraldic Illustrations was probably a bit of heraldic puff by Burke’s and/or the Cohams. Azure within two chevronels Or two lions passant counter-passant of the last supporting a fleur-de-lis Argent the whole between three mullets Argent pierced of the field.